Ellen MacArthur was born in 1976, and grew up in the Derbyshire village of Whatstandwell, about as far from the sea as you can get in England! Her earliest experiences of sailing was as an eight year old, in her aunt's boat on the East Coast. Ellen saved up over several years to buy her own boat, an 8' dinghy, and spent a lot of time reading sailing books to learn all she could about the subject. She did think about being a vet when she left school, but her sights were more set on becoming a professional sailor. When Ellen single-handedly sailed all round the coast of Britain in 1994, she won a 'Young Sailor of the Year' award. In 1997, she refitted her 21' yacht Iduna, and raced it alone across the Atlantic, taking 33 days to cover the 2,700 miles. With sponsorship from the Kingfisher retail group, she bought a 50' yacht in which she finished fifth in the 'Route Du Rhum' race in 1998. This encouraged Kingfisher to back her with £2 million to represent them in the 'Vendee Globe' ('Round The World') race in 2000. The race turned out to be a triumph for Ellen, as she finished ahead of all but one of the other competitors, and made headlines all round the world. Everyone now knew about the girl from Derbyshire, and the Queen awarded her the MBE. 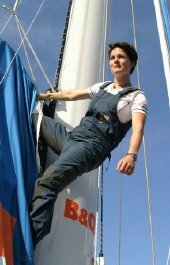 In 2003, MacArthur failed in her attempt on the Jules Verne 'Round the World' record when her mast broke, and the following year she just failed to beat the 'west to east' transatlantic record by 75 minutes. 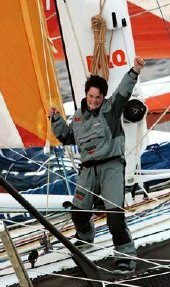 Ellen's greatest triumph came in 2005, when she beat the solo 'round the world' record (then held by Frenchman Francois Joyon) by covering the 27,000 miles in 71 days, 14 hours, 18 minutes and 33 seconds! The boat she used was a trimaran called B&Q/Castorama (Kingfisher own the d.i.y stores B&Q in the UK, and Castorama in France). The voyage had some near disasters, with mountainous seas, gale-force winds and icebergs constantly threatening to capsize her. In 2003, the Ellen MacArthur Trust was formed, with the aim of "supporting children with cancer, lukaemia and other serious illnesses, by introducing them to the joys of sailing on the sea". Ellen is an active member of the Trust and joins in with the children's activities whenever she can. Ellen now lives at Cowes, on the Isle Of Wight. Ellen MacArthur now has two books to her name. Taking On the World (2003) tells the story of her early sailing experiences up to the 'Vendee Globe' event. Race Against Time (2005), with lots of photographs, is the story of her 'round the world' record in the trimaran B&Q/Castorama. She signed my autograph book and a photograph, both with the slogan, "Go For It!" You can see me below showing her how to spell my name which is written on a piece of paper! 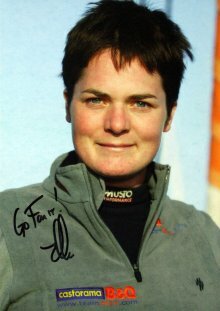 I met Ellen MacArthur in April 2005 when she paid a flying visit to my local B&Q store. There was a very long queue to see her and talk to her. On day 63 she almost collided with a whale, and was badly bruised when having to scale the mast to make repairs. When she arrived back at Falmouth, to a heroine's welcome, it was announced that the Queen would be honouring Ellen with a Damehood.